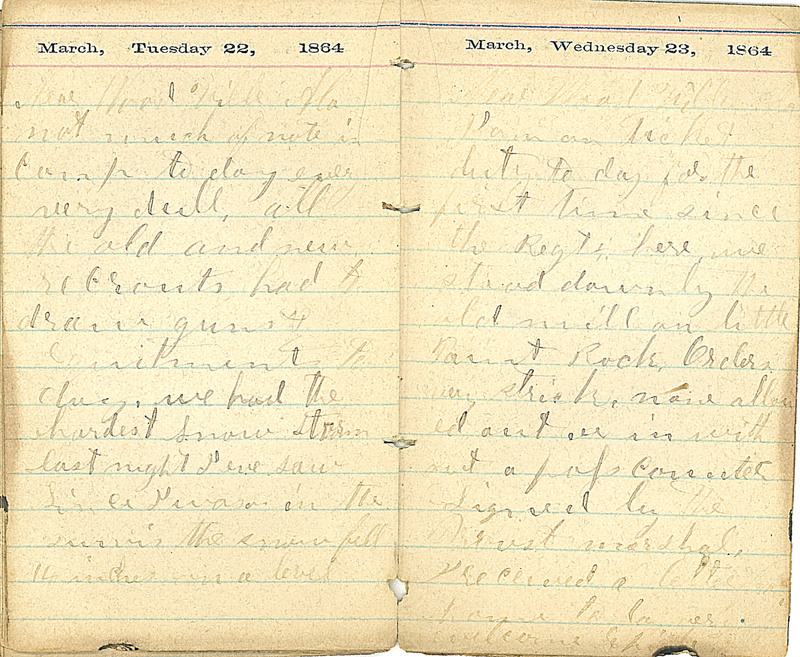 March, Tuesday 22, 1864 Near Wood Ville Ala not much of note in Camp today every very dull, all the old and new recrouts had to draw guns & equitment to day, we had the hardest snow storm last night I eve saw Since I was in the servis the snow fell 14 inches on a level March, Wednesday 23, 1864 Near Wood Ville Ala I am on Picket duty to day for the first time since the Regt. here, we stand down by the old mill on little Paint Rock, Orders very strick, none allowed out or in with out a pass [Correctely?] Signed by the Provst marshal, I received a letter [?